We heard a few months ago that Google is planning to launch an ITA integrated-flight search product. For background, the DOJ finally approved Google’s $700 million acquisition of airfare software company ITA in April, and Google officially closed the acquisition days later. The deal was being investigated as potentially being anti-competitive to the online travel search industry, as ITA’s software is used by many of Google’s rivals in travel search including Microsoft, Kayak, and Expedia. 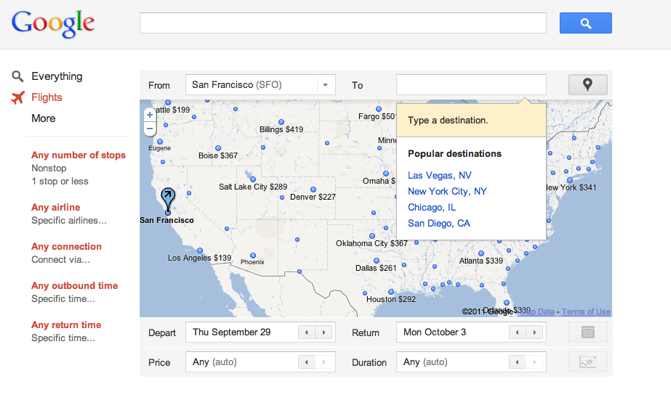 Today, Google has unveiled its flight search portal, Google Travel. Basically, you enter your origin and your destination, dates, price parameters, durations and more. You can also set filters for for number of stops, airlines, connections, outbound and inbound times and more. Results appear within the same page, in a grid like format below a map showing the route and fares. You can lick on your selected flight, choose a desired return flight, and book the flight via the airline website. It’s a fairly simple web interface, and Search Engine Land says that Google will also be experimenting with advertising. And the portal doesn’t feature one-way or multi-city fares. For now, travel search just focuses on flights but it should be interesting to see if Google will add hotels, and more to the search site. The big question is how Google meaningfully entering the travel search market (armed with ITA Software) will impact its competitors like Kayak, Expedia and others. Kayak and Expedia currently offer more feature-rich search portals. But Google is a giant in the search space, so it’s not unreasonable to think that the company could capture serious market share in travel search. Kayak issued this statement in response to Google’s travel portal. We’re confident in our ability to compete, and we believe our flight search technology is superior. We recognize Google is a formidable competitor but they haven’t been successful in every vertical they’ve entered. We use multiple data sources and proprietary technology, all of which helps us in our efforts to provide people with comprehensive, fast and accurate answers to their flight search needs.